Let’s face it: the smell of freshly sharpened pencils, of newly laundered gym strips, of paper and pens and binders ushers in the gorgeous Canadian fall season. But more than anything else, there is the smell of new books. Is there any better smell than that? Especially at this time of year? And if you disagree, well, you should take that up with one of our panel of independent booksellers. They’ve weighed in this month with a healthy crop of books for the fall. And, for possibly the first time in this column’s history, two of our booksellers have chosen the same book. Over the years there have been many cookbooks written on "how to survive during the school year" aimed at young adults heading off on their own, but what about parents needing to get the family back into a routine and dealing with hectic schedules once again? 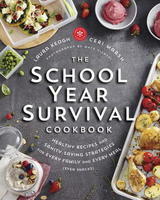 Laura Keogh and Ceri Marsh present The School Year Survival Cookbook—healthy recipes and sanity-saving strategies for every family and every meal. With 110 recipes and road-tested strategies parents will find ways to keep event the most chaotic weeks on track. Delicious dinners that transform into healthy lunches and even some mouth-watering snacks thrown in for good measure. This classic by Little has been reissued on its 40th anniversary (out September 26), but its themes of compassion, cultural discrimination,and social justice are unfortunately as relevant today as they were four decades ago. Anna (From Anna) is about to start a new school when she and her family hear that Canada is has entered the war. As recent immigrants from Germany, Anna and her family face bullying, boycotts, and hatred from their new town as they struggle to find their place in Canada. When her beloved brother, Rudi, decides to enlist and ends up injured, it is up to Anna to stand up and to become the light her family needs. Listen for the Singing won the Canada Council Award for Children's Literature (now the Governor General's award), and remains a timeless classic that families and classrooms can read and discuss together. Microbes are everywhere, including all over our bodies, but Finlay and say that's good, and tell us why. This book explains why we can't live without microbes and warns that the more we do to wipe them out the more susceptible we become to their negative effects when they break through our defenses. As our kids head back to school and many of us return to the world of work, this well-written, fact-filled and thought-provoking book will help parents and all of us to rethink how we can live better in a less sanitized world. A back-to-school must. Not only are you provided with delicious and family-approved recipes, you'll also learn to meal plan and use the leftovers from last night's dinner for a whole new dish. This cookbook is brilliant, yummy, and begging to be in the kitchen. Robert Rotenberg delivers again with his fifth Ari Greene mystery. The streets of Toronto aren't always as safe as we Canadians like to believe, and in a time of skyrocketing real estate sometimes the speculators don't get along. That's the thinking when flamboyant developer Livingston Fox is found impaled on some rebar on one of his downtown condo sites. Rotenberg is a criminal lawyer and knows the process and the courtroom inside and out, lending absolute authenticity to the series. He's a hell of a crime writer as well, and he's only getting better.